pie in the sky: "I am going to make a peanut butter sandwich." Allow me to introduce you to precocious epicurian prodigy Baby Kate. 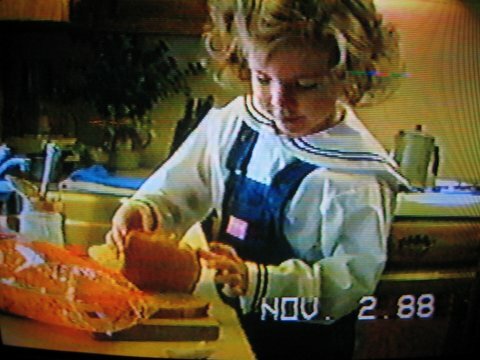 In this blast from the past, little Kate (here at the promising age of four, in a nautically-themed outfit) will give you step-by-step instructions on how to make that famous culinary item beloved by children everywhere, the peanut butter and honey sandwich. "You get some bread and put some honey on it..."
"Then you get some peanut butter and put it on the other side. Then you smooth the peanut butter. I am just getting all the peanut butter off so I can get some more..."
"Then you put it on..."
"...and eat it! Mmmmm...I sure do know how to make 'em!" I believe that in this video I go on the feed the sandwich to the cat. 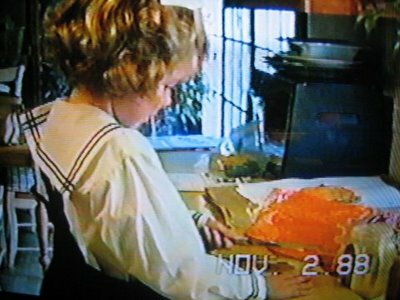 Thanks to mom for digging out the old camcorder and capturing these stills! Also, my apologies for my recent absenteeism - next life goal: to get responsible living to coincide with responsible blogging. My heartfelt gratitude goes out to all of you who asked after me this week - thank you for making this slice of pie feel special! Oh how I love Baby Kate! Although I didn't get to meet Baby Kate, I did get to meet Pre-Pubescent Kate, which was just as awesome. Love you! Again Where Did She Go? wanna know something funny? i was going through some old pictures the other day and found some from greatma's house about a thousand years ago and i was barely able to tell which one of those millions of great-grandchildren i was let alone which one you were, but now i have a comparison point. you're the one who looks like me, but my hair is much darker. funny thing, family resemblances. Very, very cute. that's a goal we all share, my dear. Needless to say: I'm glad you're back! Oh my gosh that is cute! 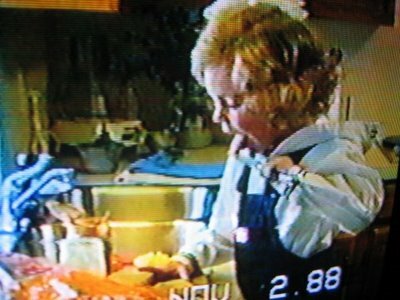 What a treasure to have footage of your first cooking "class." You were clearly a foodie from the beginning. Just got back from Key West - glad you are back, too! 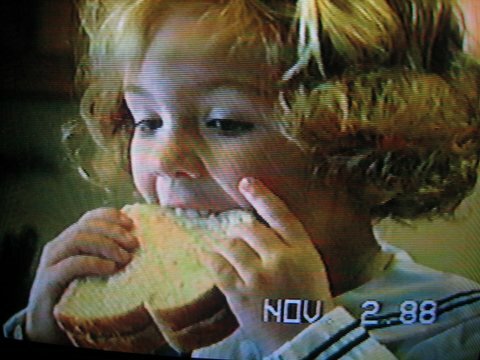 You look like Shirley Temple making a PB sandwich! 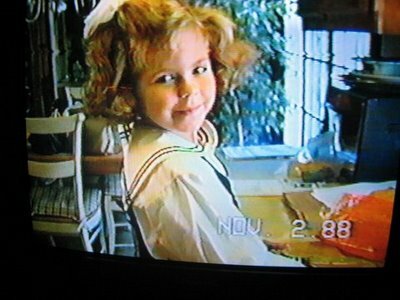 :) I love this old school adorableness! Ever go to Peanut Butter in the village? How fantastic! Don't worry about the 80's kitchen it's all part of how we got to today! Love it. That is the most adorable thing ever! You are a cutie pie.